Anyone can learn to read the Tarot, as knowledge is free, and open to all of us. But to appreciate the true knowledge it contains, we must learn from our own life experiences – for this is what it symbolizes. I have been Tarot reading since 1975 and offer private Tarot readings in London and Surrey. Please contact me if you would like to book an appointment. The beautiful tarot is a tool that can be used for steering oneself on the path of greater awareness – a vast path with many a turning. You will find the Tarot, with constant use and handling will become one with you, just feel the flow of the vibrations each different card will give you. And love your Tarot cards like I do mine. You can never come too early or late to Tarot reading. And to perfect your readings practice, practice, practice. If anything in life is worth doing I believe it is the determination and desire to pursue perfection. A bond will grow with your Tarot pack – just feel them, talk to them, become one with your Tarot. Respect them and you will find through perseverance and study you will accomplish many things with the beautiful Tarot. My first Tarot card pack I bought in 1975, the Rider Waite Tarot. It looked and felt like gobbledygook to me. I was only young, but so interested with all matters of the occult and spirituality. I practised Tarot reading and tried to learn but it didn’t come easily. Do not expect miracles overnight! I persevered and came to respect and to love my Tarot cards. You need inner judgment and imagination, plus lashings of clairvoyance – it is a book of wisdom. 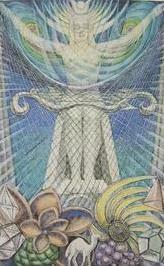 My next pack, which I still have today in my Tarot box, was bought in 1978 – the Thoth Tarot pack. I saw this Tarot card pack and there was an instant attraction, they are the most beautiful cards designed by Lady Freida Harris, who was an Egyptologist and worked apparently twelve hundred symbols into the seventy eight cards. The Tarot cards are splendid and I think quite beautiful. But it’s you yourself who must use your own intuition on which Tarot pack you would like to use. The one you choose will be the one that is right for you at that moment. Reading the beautiful Tarot came naturally to me, I have never had a lesson as I am self-taught with the aid of the wonderful wise old Tarot. In 1993, I bought my second pack of Thoth Tarot cards, these are the ones I’m still using today. My older pack, I keep in a special Tarot card wooden box, which was made for me by a very dear friend’s husband. I designed it with the eye of Shiva – also a Sagittarian symbol – which is on the front of my wooden box. Both my Tarot packs are wrapped in silk cloths, this keeps the vibrations in when not being used. You should always keep your Tarot cards wrapped up and always, always respect them. They will then respect you and you will find you will work well together. Remember, a Tarot reading will only tell you what might happen and is a marvellous tool to guiding you through life. Please remember it refers to possibilities – we all have choices in life, it refers to what could be, not certainties, whether you let life’s lessons, situations, and circumstances in your life, define you, strengthen you or consume you, your own wisdom and knowledge will grow through all these experiences. Life is full of ups and downs and you will experience both, the good things in life I believe, out weighing the bad. Work with wisdom, work with love and compassion and your beautiful Tarot will work with you. Please be careful with tarot readings that you do for your friends and clients, and remember that you are playing with people’s lives. I wish you all well on your Tarot reading quest, enjoy your enlightening journey. Number 2 of the Major Arcana, the High Priestess. She represents lunar power and, therefore, has strong connections with Tarot Card No. 18 (the Moon). The High Priestess symbolises the New Moon and the female forces. She is the Mother of Wisdom and has a strong influence behind the changes and flow of the occult tides. Positive qualities of the High Priestess are occult sciences, mysticism and working with her clairvoyantly. The High Priestess in a spread can bring dramatic changes in the client’s life. And it can be expected to take place after the next new moon, following the clients reading. The High Priestess denotes spiritual awareness, inner enlightenment and a deeper understanding that cannot be said by mere words. This beautiful card has maintained this high position through constant training, study and practise. She can signify the natural power that all of you have within yourselves. The High Priestess is very intuitive and knowing, and she is gifted with wisdom, knowledge and a self-realisation of life. If you would like a Tarot Reading in London or Surrey please contact me. I am also available for events.